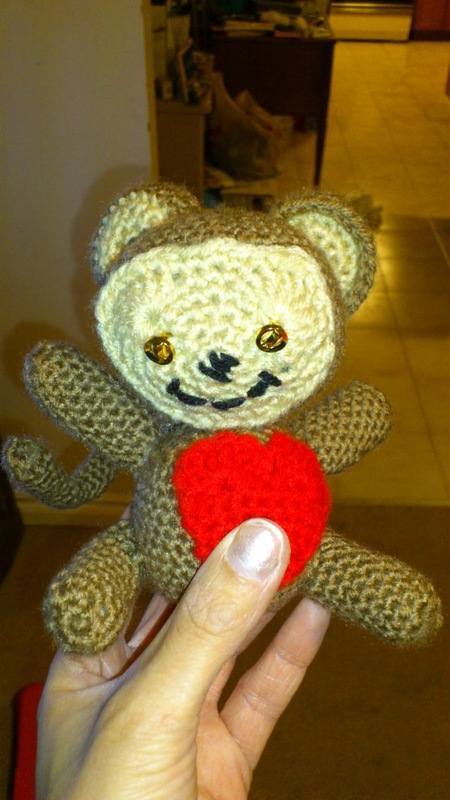 I came across this pattern in an email from Red Heart and he was just so adorable I decided he had to be made for Valentine's Day. I was a little worried about it at first as I have had problems before with making things that start with a circle but you only get better by trying so I got the yarn and jumped right in. I didn't have any floral wire on hand so the original plan was to use a pipe cleaner to make a poseable tail but of course when it actually came time to finish him off and sew on his tail I couldn't fine one. So in the end I took apart an old fake flower that has been sitting on my desk for the better part of forever and used the floral wire from the stem. Waste not want not and all that. I think he turned out just adorable and he is much loved at his new home as you can see. Now, the downside to tackling the monkey and having it come out well is that Cat witnessed it and is now convinced that Mommy can make anything. I have since received requests for a giant monkey, a pink circle blanket, a Rainbow Dash costume, a Buffy costume (okay, that one made me just a bit proud) and various other small things. Ace requested a blanket too, no color or style requests though just that it be warm. He is a much easier to please child. Thank you. Bailey is a very hard to please kitty.